Free Talking Head Fill-in-the-Blank Video Script! A talking head video is one of the best ways to use video online to market yourself. But what are you going to say? This post has a fill-in-the-blank talking head video scripts you can copy. Just swap out the details and use the script as your own. Now how is that for an awesome present? First, let’s look at this video talking head I did for a client. It follows the basic sales script format I use all the time. You can use this format too. Just make it specific to your product. Watch the video and see how I flush out the basic format into a video lasting 1:24. Now we’ll talk more about how to make talking head marketing videos just like this one! Other sample talking head script templates are below. For a talking head marketing video, (the kind I keep insisting is the easiest and most effective thing that most my readers can do) this script templates work well no matter what your product or service. It can be adapted and customized for anyone. Script writing using this template is largely a fill-in-the-blank exercise. What Makes a Good Script for a Talking Head Video? Much to the dismay of the creative side of me, writing a script for this kind of video is not an exercise that would put in you in contention for an Oscar in scriptwriting. Rather, a good talking head sales script is simple, clear and gets your point across quickly. A talking head video script like this is a brief introduction of you and your service to the potential customers. Say hello and tell them the essential key elements. Be brief and focused. Lay out the typical problems and how your product is a solution. Give a distinct call-to-action. Final length should be no more than two minutes for a video of this style. One minute, or even 30-45 seconds, might be best in most circumstances. Keep it short but at the same time, give them all the info they truly need. In your script, make sure you give some kind of reason why your service is the one they should select. This could be based on experience, superior skills, or because you are giving a great bargain. In other words, spell out the benefits of you and your product. Then, add a distinct call to action. Whether the call to action is to buy this or sign up for that or email you, be specific and directly ask potential customers to take the next step in doing business with you. After reading the example below, think about your own business then write out your own talking head video script using the specifics of your business. Practice reading it aloud. Listen for flow and how easily the words come out of your mouth. A good video script needs to use words that are easy to pronounce. Even professional narrators do poorly with tongue twisters. Modify your script as you hear it aloud to make to flow better. Then, set up your camera and lights and you are ready to record. Use some sort of teleprompter like your laptop. 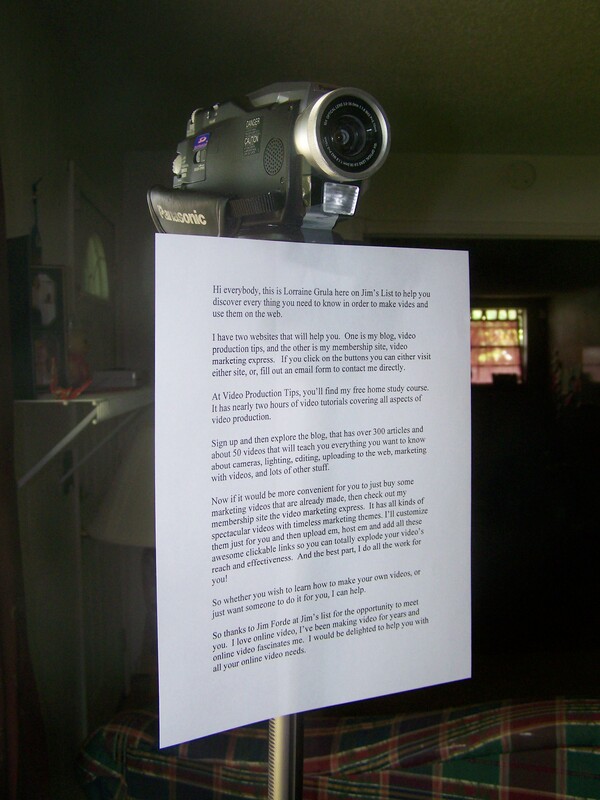 Even scotch taping a copy of the script to the bottom of your camera lens can function as a low-budget teleprompter. My product or service is ____________________. If you have _______________ problem, my service can benefit you in these ways _______________________. I am better than my competition for this reason ________________________. So take this action __________________________ in order to reach me so I can make your life easier. You will be rewarded with this _______________. Thanks, goodbye. Take this skeleton script, fill in the blanks, then dress up some of the language by using more powerful verbs, more descriptive adjectives, and a bit of professional jargon. Make it sound true to YOU. Read it out loud to see if it sounds right. If it doesn’t, change it around until it does. You can put a lot of meaning into a script using voice inflection and tone and that can affect what words you use. So reading it aloud is an essential part of the process. That’s all you need to do to have a very functional script for your talking head marketing video. That wasn’t hard, was it? Thanks so much for these tips! As an online copywriter, I’m always looking for new ways to help my clients promote their businesses. Video marketing is here to stay and these simple outlines will give me something to work with while helping clients make their own videos. Thanks so much for your kind comment. I am always gratified to know my blog helps people. Please feel free to share my script templates with anyone as long as you always tell folks where they come from. Thanks. Glad to hear it! You use those scripts to your heart’s content. I can just about promise you that every single talking head video you do from now until Kingdom come will be very similar to those scripts. So hold on to them! Thanks for leaving a comment. thank you so much for the tip and example, it’s help me a lot,and give an idea to start…thanks. God bless you. Thanks for making this really simple so a non-marketer like me can get a handle on videos. You are so very welcome Catherine. I am always happy to help people learn video. There is a lot here and all of it is free right now so explore and have fun. My best advice to novice who wants to do marketing videos is stay real simple or hire a pro. KISS Keep it simple! Talking heads with natural light and webcam is easiest.